Little eight-month-old Elona Albrecht was buried in the Pagel Cemetery at Willow Springs in 1918. Around 1858 Gottfried Pagel and most of his family moved from Willow Springs to a farm six miles southwest of Hallettsville in Lavaca County, Texas. The area became known as Pagel Settlement and can be found on old maps of Lavaca County. Today all that is left is the Pagel Settlement Cemetery off FM 530 on Country Road 134, which goes right through the cemetery. While the markers west of the road were mostly accessible, the markers to the east of it could not be seen through the brush until a recent cemetery clean-up by members of the Pagel, Rother, Einkauf, Meyer, Rickaway, and Ullrich families. Another clean-up is planned for next fall. A wire fence with iron posts encloses Gottfried Pagel's grave. The only other Pagel relative known to be buried at this cemetery is his granddaughter, Caroline Fischer Gautel Wiechring, who is buried here with her husband and his parents. The cemetery has sometimes been referred to as two separate cemeteries, the Meyer and Bonorden Cemeteries. See a list of burials in the Pagel Settlement Cemetery. Contact Rox Ann Johnson if you would like to participate in future clean-ups. Carl Friedrich (or Charles) Pagel and his wife Johanna are buried in the Charles Pagel Family Cemetery on what was his estate in Lavaca County. Also buried at this cemetery are his daughters Johanna Dorthea Pagel, Maria Kessler, and Hilda Menking, Christine Roeber, Elizabeth Haeusler (Heisler) and their husbands, as well as his sons Henry and Charles Godfrey Pagel and their wives. Johanna's father and mother, Heinrich and Johanna Krause Kuehne, the Pagels' son-in-law Rudolph Henkel, and several grandchildren were also laid to rest there. 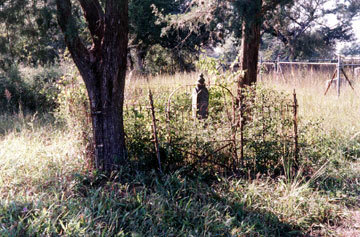 The small, fenced cemetery is northeast of Hallettsville in a pasture owned by the Menking family. The earliest burials seems to be for the Pagel's infant, Johanna, who died in 1874. The earliest marked grave is for Paul Ebel, who died in 1883. 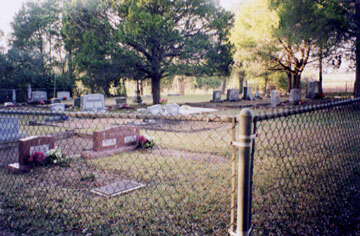 See a list of burials in the Pagel Family Cemetery north of Hallettsville. Six generations of the Friedrich Wilhelm Pagel family are buried in the Pagel Cemetery at Willow Springs in Fayette County. This is also the resting place of Johanna Pagel, Gottfried's second wife. We suspect that our matriarch, Friedrike Pagel, may also be buried there in an unmarked grave. This land was originally part of Gottfried Pagel's farm and was sold to his oldest son, Friedrich Wilhelm, after Gottfried moved his family to Lavaca County. The oldest tombstone marks the grave of Friedrich "Wilhelm" (or William) Pagel who died in 1873. 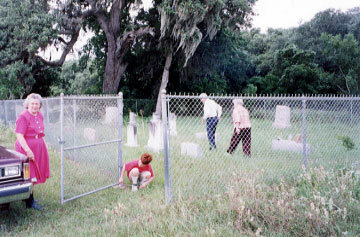 The Pagel Cemetery is well-kept and enclosed within a chain link fence. It is the site of seventy-eight known graves, fifty-seven of which are identified with tombstones. Several of the graves had been marked with shells, but now only fragments remain. Many of the markers bear German inscriptions. The majority of the tombstones mark the burial places of members of the Pagel and Henniger families. However, many other early residents of the Willow Springs community are also buried here. The Pagel Cemetery lies beside Darden Loop off FM 159 in southeastern Fayette County, just west of the Willow Springs community. See a list of burials and a map of the Pagel Cemetery at Willow Springs. Gottfried and Friedrike (Dickow) Pagel came to Texas from Pomerania in 1850 with eight children and purchased land in this vicinity in 1852. The following year, Friedrike died shortly after giving birth to her ninth child. In 1855, Gottfried wed widow Johanna "Anna" Zorn Fritsche. 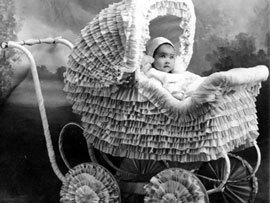 Her daughter Magdalena wed the eldest Pagel son, Friedrich Wilhelm, known as Wilhelm, in 1858. Gottfried moved his family to Lavaca County, but Wilhelm and Magdalena stayed in Fayette County. They bought more land at Willow Springs, where Wilhelm built a stone house, operated a store and served as the first postmaster for the community known then as Rock House. Wilhelm died in 1873 and was buried on the original Pagel land, where his mother may have been buried 20 years earlier. His is the first marked grave in what became Pagel Cemetery. Magdalena died in 1886, and hers is the second known burial. Many neighbors joined the Pagels in burying loved ones here, and there are numerous interments from the extended Henniger, Garlin, Kruse and Lincke families. The cemetery is maintained by descendants of the area's pioneers, many of whom were of German heritage. See the photos from the October 21, 2006 Dedication of the Historic Texas Cemetery Marker at the Pagel Cemetery at Willow Springs in Fayette County. Contact Rox Ann Johnson regarding the newly formed Pagel Cemetery Association, which meets annually at the cemetery in Willow Springs on the second Saturday in October.